Join Sue Everett for a general yoga workshop exploring what it means to live with a practice, how we move with it over a lifetime and how we can sit in stillness with it. Sue has extensive knowledge of the body gained from her background in classical & modern dance in Australia and Europe that informs her practice at a deep level. Following a spinal injury, Sue returned to Melbourne and was introduced to the healing qualities of Iyengar Yoga. Sue began teaching yoga in 1991, and enjoys traveling within Australia and overseas to teach & train yoga teachers. 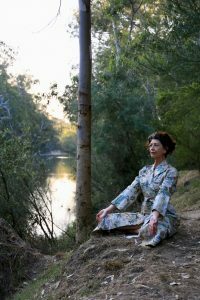 She is the director and principal teacher at Yoga Jivana in Melbourne and has previously served as president of the B.K.S. Iyengar Yoga Association of Australia. Fully qualified directly from Geeta S Iyengar, Sue is a Senior Intermediate 3 Iyengar Yoga teacher, Teacher Trainer, and Assessor. Sue’s interest is to promote a deeper understanding of how to support and nurture a holistic and disciplined yoga practice while incorporating the fundamentals of yogic philosophy. Sue’s teaching style, while welcoming and encouraging to all, emphasizes a rigorous and challenging approach to the practice of yoga asana and pranayama. Sue is known for her clarity in teaching the intricacies of yoga practice and teaching. A $50 NON REFUNDABLE deposit secures your place. The balance should be paid in person at the start of the workshop. To make a booking please call, email or book online. Let’s face it: Motion is lotion and movement is medicine. To some degree it depends on how we practice and how we move. We will explore how our practices can improve the functionality of our joints, create more fluid integrated movement, and improve the quality of our life in numerous ways. We will look at how we can improve our strength throughout our ranges of motion, and gain better motor control in all of our asanas and all of our movements. Fundamental principles, and basic asanas will be interwoven into sequences that progress to some more challenging asanas like arm balancings, backbend variations, and several poses from the Jr and Senior level syllabus. There will be plenty of challenges combined with healthy doses of fun. Iyengar teaching credential and continues her studies with the Iyengar family by traveling to India on a regular basis, as well as by continuous and in-depth studies with her teacher, Patricia Walden. Over the years she has performed in and co-choreographed many yoga demonstrations, including Live: Light on Life, performed at NYC’s City Center during BKS Iyengar’s Light on Life US National Book Tour in 2005.Before studying yoga, Carrie worked as a Movement Analyst after having completed her studies at The Laban Institute in NYC. She studied theatre and dance in college and has spent years exploring human movement, meaning and communication. A $50 NON REFUNDABLE deposit secures your place. The balance of $300 should be paid in person at the start of the workshop. Total workshop fee is $350. To make a booking please call, email or book online from November 1. CLICK HERE to book online.